"Magic smiths didn't believe in monsters, and Oscar no longer believed in magic smiths..."
In some ways, like Breadcrumbs before it, The Real Boy is a story of disillusionment. Ursu has a knack for honing in on that transitional period of not-quite-childhood, when some of the magic of life begins to dissipate and less-pleasant realities start to seep in. Oscar's world is a very small one, and everything in it is set; it's dependable, reliable . . . Until suddenly, it's not. Or, Oscar realizes, maybe it never was. Doubt — the realization that your heroes may not be as heroic as they seem, that life may not be as simple, and your own place in it not as clear-cut — is the death-knell of childhood; once you realize it's ending, it's already over. Ursu perches her story on this precarious point, and just as Oscar realizes that things are changing, everything comes crashing in on him. This is part of what makes for a good middle grade fantasy-adventure story (child suddenly finds his/herself stepping out of the carefreeness of childhood and taking on Serious Adult Burdens), but I think it's not often realized or used to as good effect as Ursu is able to achieve. But also like Breadcrumbs, The Real Boy is a story of finding your place in life and letting people in. Oscar doesn't have to go it alone. There's a sweetness to the story, to Oscar and Callie and their friendship. To the dependable world Oscar's worn grooves into, with his cats and his plants, and everything in it's proper place. Sometimes "sweetness" can sound saccharine and very After School Special, but the sweetness of The Real Boy is not forced or syrupy. It's just a beautifully conveyed story of friendship and connection; of belonging, even when you feel like you could never belong. And it's aided by the fact that everything about Ursu's writing — her world-building and character-building — feels so natural and effortless. She is able to immerse the reader in this world without the story ever feeling bogged down in excess details; she helps the reader see through her characters' eyes without heavy-handed moralizing*. Nothing feels phony or out of place. It's engaging and refreshing and so very perfect for a juvenile/adult crossover - a book and a world that readers of all ages can enjoy. Beyond the storytelling (and the story itself), I just really like the style choices Ursu made. Little things that, if done well, should be unobtrusive, can play a huge part in the overall feel of the story, and Ursu pays attention to those details. Things like sentence structure and the cadence of different characters (and yes, I know cadence is a sound thing, but you know how you can hear the characters in your head? That. ), all of those little details make the bigger picture what it is. Oscar doesn't use contractions, which adds to his feeling of being off, of being distant and at a remove from those around him. He sees himself as not quite like everyone else, and his speech (including inner narration) and interactions with people subtly build this feeling of separation and isolation from others, whom he is Not Quite Like. I don't know if other people notice these choices, these teeny, tiny things, but I do, and I appreciate them. I'm hesitant to say too much more on this, because I don't want to color someone else's reading of Oscar or his story, but I just really appreciated the choices Ursu made and the way she represented her characters. I do want to talk more about it, but I'm hiding it behind a spoiler button, so if you want to go into the story with fresh eyes and your own interpretation, please don't click. Oscar's tone (or tonelessness), his uncanny memory, and the way he relates to the people and elements around him (as well as his own impression of himself), reads like he may be autistic, but as the story progresses, you begin to wonder — are led to wonder — whether it's something more, whether it's not so much that Oscar isn't quite "normal*," but whether he's actually entirely human. Lets just say, elements of Pinocchio enter the story, which, let's be honest, were always there (it is called "The Real Boy," afterall...), but these elements begin to really come together as Oscar mixes in the world a bit more and begins to question why he seems and feels so much different from those around him. 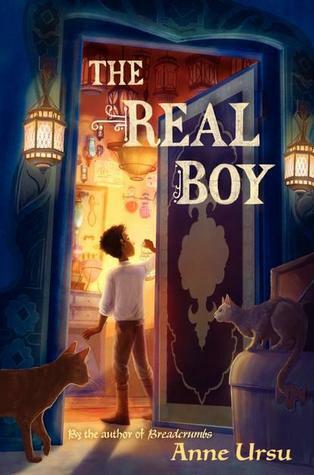 I'll leave it to you to find out which is true — whether he's not a "real" boy, or whether he's a real boy who's just different from those around him — but I will say, I'm really pleased with the way Ursu approached this, and how Oscar explores and copes with his world and his own nature. There is a sadness borne of pity, not just for Oscar's natural "otherness," but for the box he keeps himself in, or is put in by others; his separation and loneliness. But his is also a story of triumph and strength and expanding horizons, and it's this same beautifully bittersweet quality that made me love Breadcrumbs the way I do. Lovely. Ursu's skill as a storyteller is obvious, and her understanding and compassionate approach to her characters and stories, as well as her embracing of all the grays amid the easy black and white of life are guaranteed to win me over, and keep me thinking about and talking about her books for a long time to come. Breadcrumbs started me thinking, and The Real Boy has confirmed, that Anne Ursu has earned a firm spot on my author-to-watch list, and I'd highly suggest that if you haven't read anything by her yet, you should rectify that soon. It sounds interesting and your enjoyment of this book definitely makes me want to pick it up! I haven't read "Beadcrumbs" yet, but I really want to, and I'm looking forward to adding this on my TBR pile as well. I really like the premise of your book and your review revealed what I'm most interested in about this book. I can't wait to see how Ursu manages to establish the break from fantasy to reality without being too obvious. Thank you for the review! very interesting to note that it has elements of Pinocchio! I'd love to win the giveaway and be able to read it for myself!